"Busseria" or "Buxeria" meaning box (wood), heather, would be at the origin of the name current and linked to the landscape of Heath. Located on the road of Paris and close to the Loire Valley, the village became a relay station and a commercial place. The huge base of the Castle bear witness to these activities. The castle of “la Bussière” is built in the 14th century. The Castle, owned by the family of magistrates of “Tillet”, is rebuilt in the 17th century surrounded by a piece of water and the garden designed by our. After the French Revolution and since 1814, it belongs to the family of “de Chasseval”. Originally the church was located in the castle courtyard. Destroyed in 1567, she was rebuilt in 1615 on its present-day site. 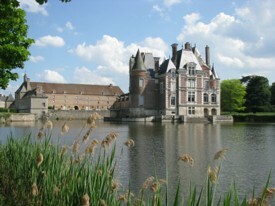 Château de La Bussière : visit of the Castle, the park, the garden and its cabins. Thursday from 9 am to 12 am and from 2 pm to 6 pm, Wednesday from 2 pm to 6 pm, Tuesday from 9 am to 12 am, Friday from 2 pm to 5 pm and Saturday from 9 am to 12 am.